Please ensure that you read the terms and conditions below before entering the Severn Mile Swim. In signing the entry form you agree to these conditions. Open water swimming is an adventure sport and participation in such sports necessarily involves a risk of injury or death regardless of the standard of training, supervision and equipment employed. 1. I agree to comply with the Conditions of Entry, the event rules and all regulations laid down by the event organiser. 2. I acknowledge that I have sole responsibility for my personal possessions and equipment during the swim and related activities. 3. I voluntarily accept all the risks inherent in Severn Mile Swim and I agree for myself and my personal representatives to indemnify and hold harmless all people, clubs & organisations (including without limitation its officers, employees and agents) against any claim or claims whether on my own account or from third parties arising out of any accident or incident resulting in any loss or damage (including bodily injury and death). 4. I confirm that I am physically fit and have sufficiently trained for this open water swim. 5. 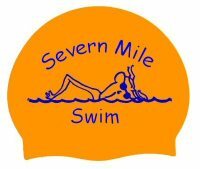 I consent to receive any medical treatment which may be deemed advisable in the event of injury, accident and/or illness during the Severn Mile Swim event. 6. No guarantee can be given as to the level, quality or fitness for use of the River and its environs at any time. 7. Any entry form received that has not been signed by the participant will not be accepted and will be returned. 8. SAFETY: If you cannot make it to the bank, roll onto your back and if possible raise your arm and wait for help. 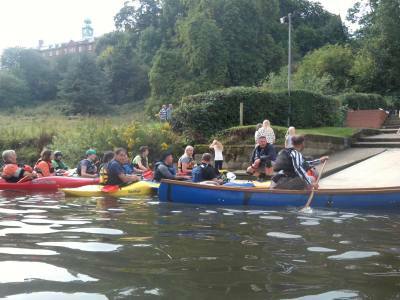 Do not climb on to the canoes, follow any instructions given. 9. HYGEINE: SHOWER AFTER SWIMMING. To reduce the chance of any infection please shower after you come out of the river. This is also a precaution against Weil's disease. Wash any open wounds and ears, etc. If you develop any flu like symptoms it is important to see your GP and tell him that you have been swimming in open water.